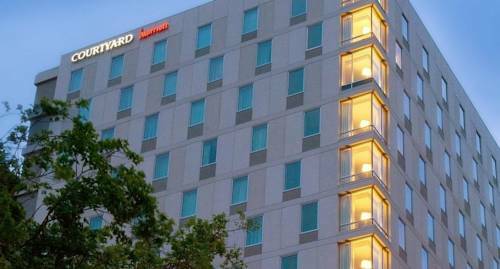 Whether you're traveling for business or pleasure, enjoy more room to relax at Marriott's only Gold LEED Certified hotel, Courtyard by Marriott Portland City Center. Our Portland Marriott hotel offers a break from the ordinary with inviting shared spaces, stylish decor and friendly, dedicated service. Unwind in rooms and suites featuring pillowtop mattresses, premium Paul Mitchell products, and HDTVs. With a MAX Light Rail station across the street, our downtown Portland, Oregon hotel gives guests easy access to local attractions such as the waterfront, Old China Town, Moda Center and the Pearl District. Business travelers can take advantage of chic meeting spaces, just minutes from the airport. After a long day, indulge in an authentic Portland, Oregon dining experience at our onsite restaurant, The Original, a vibrant social hub inspired by the diners of the 1960s. No matter what brings you to the City of Roses, you'll find everything you need to move forward at Courtyard Portland City Center. The Original: A new kind of neighborhood eatery, The Original is a cultured yet casual, swank restaurant near Portland's Pearl District. Providing patrons with a unique Portland, Oregon dining experience, The Original updates American favorites with a modern twist.